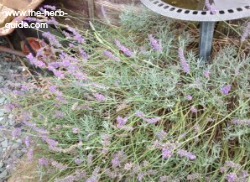 The photo above is of a Hidcote Lavender growing in my garden and this is what has been used as my stock plant. 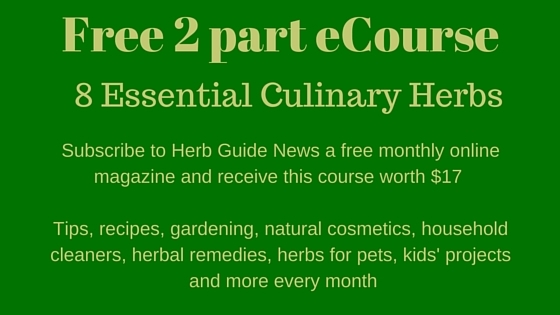 Once you have your cuttings, you need your compost. A 4 inch pot is fine for a few cuttings. Fill it to about 1 inch from the top with potting and rooting compost, then water it. Allow to stand for about 30 minutes to drain. Obviously, do this prior to taking your cuttings. 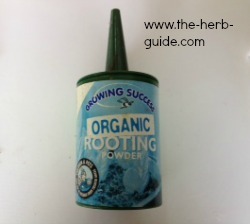 I always use a rooting powder to ensure a better success rate. You don't have to as the cuttings will strike without for the most part, but I don't like to see dead bits of twig in my pot. 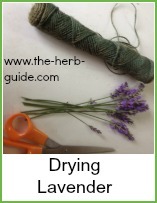 Dampen the base of the lavender cutting so that the powder will stick to it. Tap gently to remove the excess. 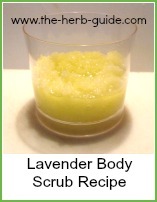 You can better see the heel in this photo that I mentioned in part 1 of the How to Grow Lavender tutorial. 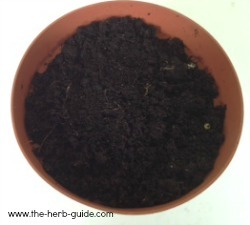 Dip all the cuttings in the rooting powder and then put then into your pot. Place them round the side evenly spaced. I have just put four in here, but there is space for another two. You just push them down so that the leaves are above the soil level - they will rot if they go below and that would affect your strike rate. Finally place a polythene bag over the whole pot. This will help maintain humidity in the absence of a propagator. 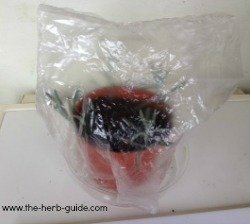 Try not to let it touch the cuttings - when I place this in its permanent spot, I will pull the bag up a bit. Leave it for a couple of weeks in a light spot. You should have signs of growth. 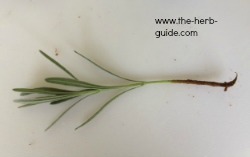 Be really patient - don't tug at the cuttings until you see real signs of growth - they won't like being messed with and you'll delay the rooting process at best, and at worst, you'll cause the cuttings to fail. Let them stay in here for a couple of months, then you can pot on individually. 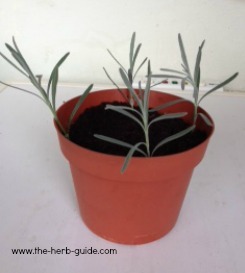 In the spring you will have some fine healthy lavender plants to grow on in your garden. 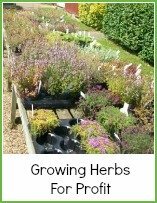 Now you've learned how to grow lavender, perhaps you'd like to check out the Growing Herbs For Profit page - turning a pleasant hobby into a potential business.